EstYes » Blog » NOMADS project has come to an end – over 400 volunteers involved! NOMADS project has come to an end – over 400 volunteers involved! 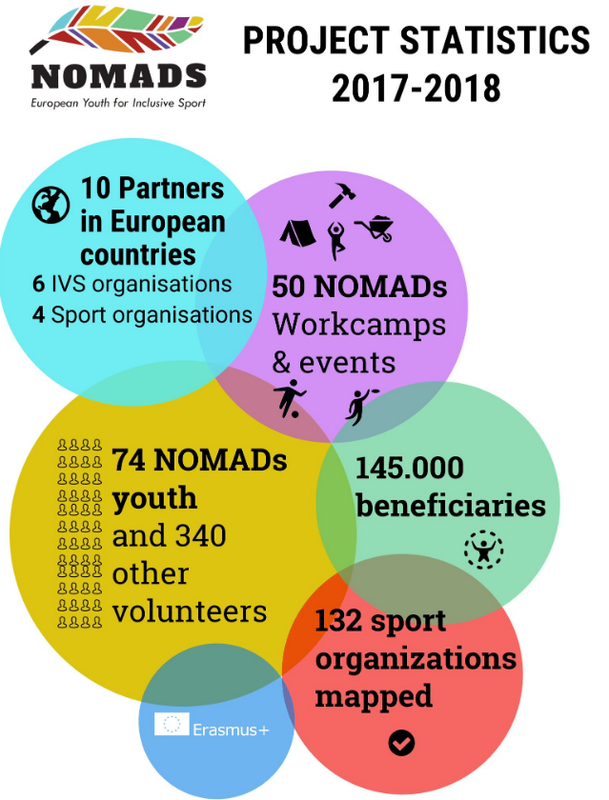 The three-year project (2016-2018) where ESTYES was involved, for the promotion of volunteering in support of sports associations that practise sport for all, was concluded at the end of 2018. NOMADS has been very successful among the young people who in the last three years have left with a simple backpacker, an Interrail ticket in their pocket, to reach the different workcamps they had chosen, and a great desire to provide their skills to create a festival, a sports event, clean a path, create a gym or build a bridge! What has been most praised by our volunteers is the intention of the NOMADs project to combine the pleasure of travelling, discovering new territories, with that of meeting new volunteers, but also other “nomads” with whom to share the experience just ended to begin a new experience together. As a result of the project, a handbook was created about starting cooperative initiatives between sport for all and voluntary service. Download the handbook from here. Check out the project’s website here.